Canon EF-S55-250mm @ 55mm & f/5.0. Aquired at 15.8 arcsec/pixel. Shown at 109.7 and 39.2 arcsec/pixel. PixInsight processing includes calibration, debayering, registeration, stacking, gradient repair and non-linear stretching with HistogramTransformation. 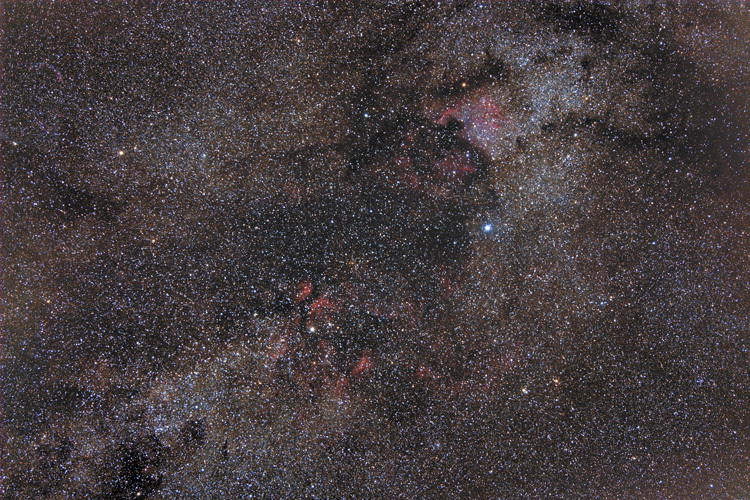 The image is centered on the stars Deneb and Sadr in the constellation Cygnus. Featured, near the top, is NGC 7000... The North American Nebula. In the upper-left corner is NGC 6992 The Veil Nebula.